Note the gap in the Dunkirk Jetty to allow entrance into the Wick channel. Picture of latest works at Dover Western Docks - taken on my last recce mission in Nov. The shape of the new Marina is evident now and the area to be infilled. No wonder they wanted to use sand from the Goodwins! Thank you for the replies, the marine workshop in Folkestone is well known but there is a gap in the mapping timeline to confirm that it was actually removed in 1922. And unfortunately the maps of Dover do not identify individual buildings so that this date can be verified. It is shown on the 1873 maps 1:500 and 1:2500. There was a line that ran along The Stade side of the harbour with a turntable (not sure of the correct terminology) at the end of a jetty at the Eastern end of the harbour parallel to the East Pier, it is not clear if the line went along the jetty, I think it did but am not sure. The line ran Northwards where a carpenter's shop and a smith's shop were located east and north of the line respectively. It joined the main line on the approach to the swing bridge via another turntable at the Western end of The Stade, this also had a branch off along what is shown as a slipway on the later maps. It is shown on the 1898 and 1907 1:2500 maps. Re: Dover Western Docks: SER workshops from Folkestone harbour? I am building a model of Folkestone harbour. The research into the history of The harbour has revealed that South Eastern Railway built a workshop on the eastern side of Stade in 1863. It is thought that this facility was built to service the cross channel ferry steamships, and marine boilers and other equipment were manufacturered there. In 1922 the tools and workshop was relocated in Dover docks. Does anybody has any more information, please? The Dover tugs only had DH on their funnels. I would think that the lettering is DHB - Dover Harbour Board ? 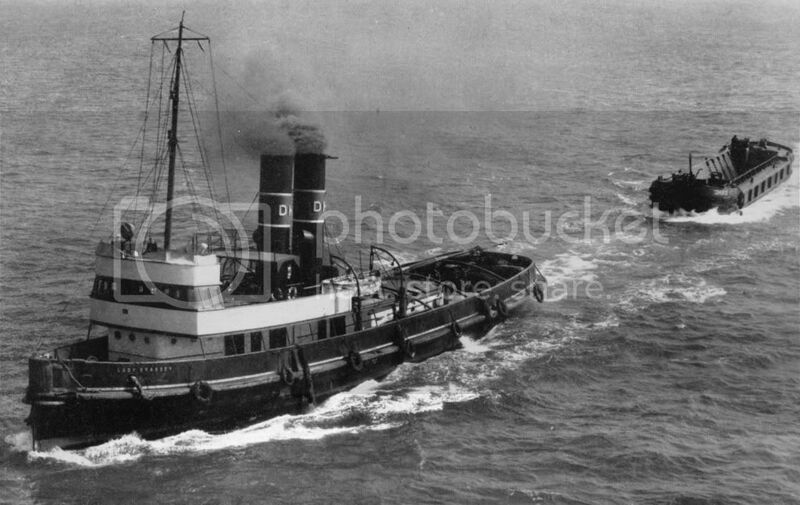 I wonder if anyone recalls the Tug "Lady Brassey"? The name stuck in my mind and this thread brought her back. & they're still there !